Taste test: These are good barbecue chips with lots of salt (and some sugar too) and a sweet and slightly tangy barbecue taste. 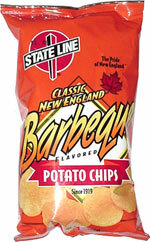 They're not the best barbecue chips in the world, but they're a good, solid barbecue chip. They leave a lot of powdery residue on your fingers, so bring a napkin. Smell test: Smells like a bag of potatoes, sort of. 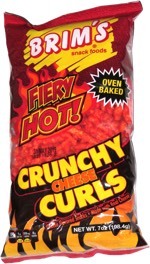 This snack was discovered by Jeremy at Uncle Sam's Pizza, Ware, Massachusetts. Review published .